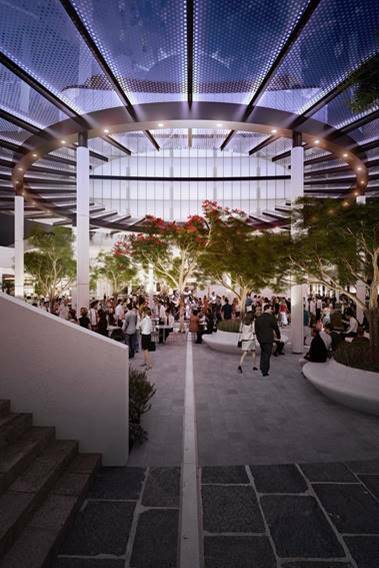 QV1 redevelopment is now open for business and the centrepiece of the transformation is the Oculus, a steel ring girder which doubles as an opening to the sky above the tower’s iconic plaza. This area is a vibrant meeting place where city workers and visitors can enjoy quality food and beverages, pop up events or catch up with friends and relax in the lush environment. The Oculus was fabricated at Cays Engineering and consists of four main sub-assemblies weighing several tons each. Using the latest technology and world-class dimensional control survey practice, RM Surveys verified and digitally assembled the Oculus, removing the necessity for the fabricator to physically pre-assemble it. Any refinements necessary to improve the fit were accurately marked on the structure for machining. The fit between modules and the columns on site were also verified, ensuring a perfect fit on the day of installation.